John Gutzon Borglum (jon GUT suhn BORG luhm) was born March 25,1867 into a Mormon* family which practiced polygamy. * His father had two wives, but when he decided to not be a Mormon anymore he discarded Gutzon's mother, and the boy was raised, along with eight other children in the family, by his step-mother. He had an unhappy childhood and tried to run away numerous times. He moved to California and studied art, then he went to study in London and Paris. He chose sculpture as the medium for expressing himself. Returning to America in 1901, he completed many important projects in the next ten years. He decided Americans would be receptive to large massive works and started looking for a project site. His first attempt was at Stone Mountain in Georgia. He attempted to carve a large mural in the side of the mountain to commemorate* the Confederacy,* but he only partially completed it. 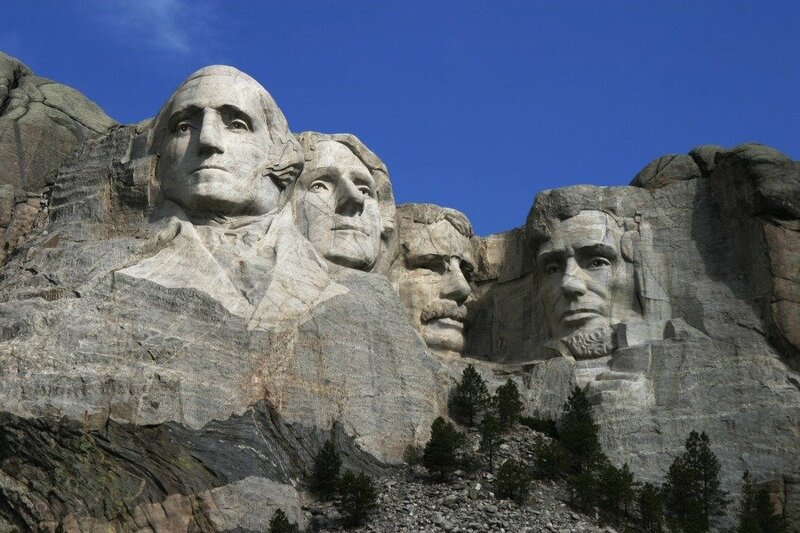 Leaders from South Dakota were looking for a tourist attraction to bring revenue to the state and contacted Borglum about carving some faces on Mount Rushmore in the Black Hills of their state. They suggested regional heroes, but Borglum told them it would be better to use national heroes, so they settled on presidents George Washington, Thomas Jefferson, Theodore Roosevelt, and Abraham Lincoln. He told his 12-year-old son, Lincoln, "Nothing but the Almighty can stop me from completing this task." Borglum made a model of the figures before he started. One inch on the model represented one foot on the finished sculpture; a 1-to-12-inch scale. You will notice that more of the body and arms are shown in the original model. 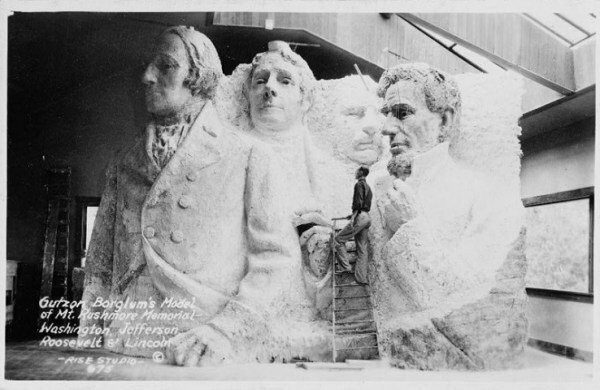 You can still see this model today when you visit the Sculptor's Studio at Mount Rushmore. Senator Peter Norbeck became his ally* and helped him raise money for the project. Norbeck invited the president, Calvin Coolidge, to visit the site and convinced him to arrange for the government to pay part of the cost. Borglum hired local men to do the work and trained them. In about a year the face of Washington was finished and dedicated, then came the Depression. * Times were hard and money was scarce. It seemed this project too was doomed to incompletion. Mary, his wife, was a source of constant encouragement to him. She cared for their two children and helped to manage the money to get them through the difficult times. After a year and a half work resumed on the mountain. Borglum turned over much of the supervision to his son Lincoln, then 21 years old. In 1936 the face of Jefferson was unveiled with President Franklin D. Roosevelt in attendance. He spoke of the "permanent importance" of the monument. Through the years the faces continued to emerge. 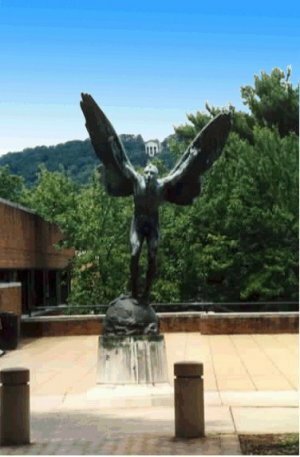 When Borglum died unexpectedly on March 6, 1941 at the age of 73, most of the work had been finished. 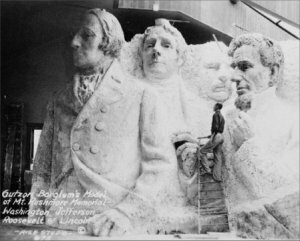 It would be up to his son, Lincoln to do the cleaning up and the finishing of the collars and shoulders of the figures. 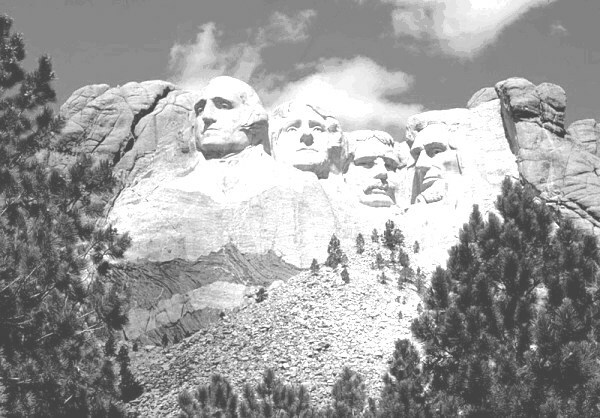 The carving of Mount Rushmore had taken fourteen years and had cost $989,992.32, slightly less than $1 million. 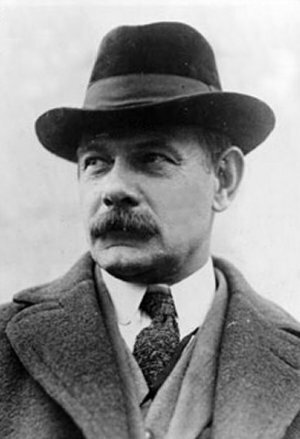 Borglum's fame was somewhat overshadowed by the creation of the Mount Rushmore monument. People remember him for that work, but other famous works by Borglum include the following works. Abraham Lincoln bust in Washington D.C.
General Sheridan in Washington D.C.
Borglum also made the remodeled torch for the Statue of Liberty and created the statues of the twelve Apostles for the Cathedral of St John the Divine in New York City. He is credited with making sixty gargoyles* for the buildings at Princeton University. The university has printed a book about them. Gutzon Borglum is buried at Forest Lawn Memorial Park in Glendale, California. His wife Mary lived until 1955, and she was also buried alongside him there. "There may be some confusion over his burial site because apparently there was a government resolution that became law that stated Borglum was authorized to be buried at Mount Rushmore. 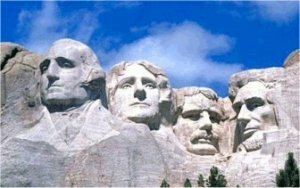 The family did not know if he really wanted to be buried there and they were not sure if provisions were made for his wife to be buried with him at Mount Rushmore so they accepted a request that he be buried in California. He had also left notes regarding his love for the state." Press "Go" to search for books about Mount Rushmore. Sad to learn that Gutzon Borglum was a member of the KKK and invaded Siouz territory to blast granite to Scuplt the most spectacular wonder monument on Mount Rushmore which part of the black hills, stolen from mother nature. A white hypocracy message for all to see. That is what I see. This page displayed 67,697 times.